For a first timer in Cape Town, you’ll definitely be spending more than a little time at the pretty V&A Waterfront. A local boutique market, a tempting street food hall and, of course, there’s the resident seals… what’s not to like? So, it’s important that your hotel is easy walking distance from here. Designed in the shape of boat, the Cape Grace really is a cut above. 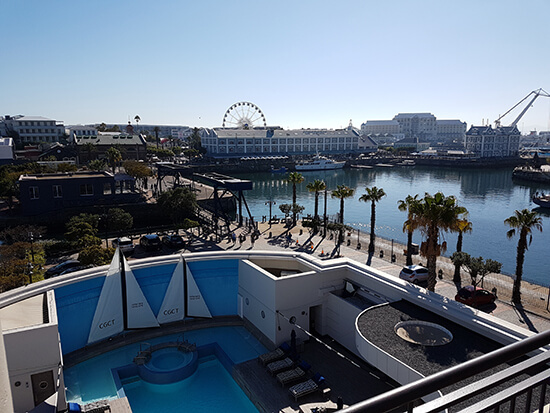 Not only is the hotel just a few steps from the waterfront on its own private quay, but it’s also positioned in a way that gives guestrooms a stunning view of Table Mountain, or over the working docks. As one of Cape Town’s finest hotels, of course, guestrooms here are magnificent. But for me, it’s the food and drink that steal the show. The Signal Restaurant is a Cape Town institution, and for good reason. My starter, for example, (a confit pork belly, seared scallop, celery purée, passionfruit, apple salsa, ginger foam) was just incredible. Perfectly cooked and wonderfully presented. My favourite feature of this hotel is the cosy whiskey bar – Bascule Bar – which stocks over 400 whiskies from around the world. The really special bottles are displayed in glass cabinets, which adds to the décor. South Africa’s winelands offer the discerning wine connoisseur a tonne of accommodation options. But while you could stay in the small city of Stellenbosch, close to some of the region’s best restaurants and bars, my feeling is that if you are travelling for an authentic wine experience then you should really be staying on a wine estate. The Spier Wine Farm, just outside Stellenbosch, is one of the country’s oldest wine farms and a great place to spend a night (or three). To make the check-in experience just that little bit more special you are offered a glass of the farm’s own Pinotage or Chenin Blanc, which gets your stay off to the right start. The smiling reception staff then inform you that your stay includes a complimentary wine-tasting session at their tasting room, wonderfully located on the banks of a small lake. But what I really love about this place is that you can take a Segway tour through the vines and surrounding farmland. Don’t miss it! Welcome to ostrich country! Yes, Oudtshoorn is the self-professed ostrich capital of South Africa. And if these flightless giants don’t do it for you then how about the 20 million-year-old Cango Caves? Whether you’re stopping by in Oudtshoorn for the birds or the boulders, you’re going to need somewhere to stay. 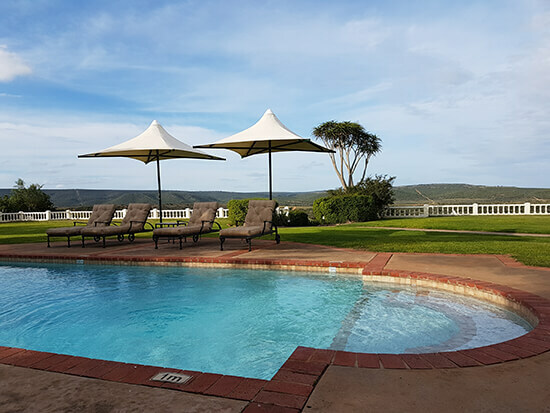 And with just 12 guestrooms arranged around a pretty garden complete with fountain, the Rosenhof Country House is exactly the place you want to come to unwind. Each room is ground level with its own porch that looks as though it was made with morning coffee appreciation in mind. There’s also a pool for when your Oudtshoorn adventures leave you with enough time for a dip before dinner. Unfortunately, I arrived too late for dinner but the breakfast was spot on. An impressive buffet and, once I returned to my table with a plate piled with smoked salmon, I was presented with a menu of cooked breakfasts too. I felt truly spoilt. I know Plettenberg is famous for its beach but fight the temptation to stay next to the sand and venture out of town a little to the Hog Hollow Private Nature Reserve. 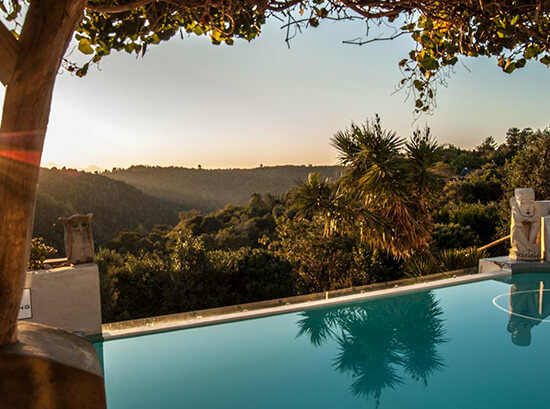 Tucked away at the end of a single-track road in the heart of the forest you’ll find my favourite hotel in South Africa. Hog Hollow Country Lodge has only 16 suites and two magnificent villas so it feels very exclusive, without being pretentious. Dinner here is a social affair that starts with a drink and appetisers outside, on a fire-lit terrace overlooking the pool. You then move indoors to be seated on long tables to encourage socialising, though smaller tables are available if you’d prefer a bit more privacy. Your hosts kick off proceedings by announcing their pre-dining tradition, which I’ll not give away so as not to ruin the surprise. And then there’s the food, made all the more enjoyable by the ever-smiling staff and intimate lighting. This place has the best positioned sauna I’ve ever seen too; glass-fronted and looking out over the leafy, green forest below. I stayed at Long Lee Manor earlier this year and, just two minutes into the drive from the reserve gates to the hotel, we were spotting zebra. You stay in either a grand Edwardian-style mansion or in a savannah-facing suite, both of which look out towards the park. Minutes after I'd checked in I rushed to the pool. It's not huge but the view is amazing. In fact, while I was standing there I saw springboks, warthogs, zebra and, in the distance, three elephants. I hadn't even stepped foot inside a safari vehicle and I was already racking up great wildlife sightings. My guestroom was enormous and complemented by a giant bathroom. But I wasn't going to be spending long there, as my first safari drive was imminent. And while Shamwari Game Reserve is huge, I was lucky enough to see lions, elephants and rhinos on my first game drive! I would suggest two to three days here in order to get the most from your game drives – as wildlife viewings cannot be guaranteed – but there's a lot here and you get two game drives per day. Chat to one of our Travel Experts about customising our Cape Town, Wine & Safari Journey to include all of these incredible properties (the Spier is already included!). Or find out more about our South Africa holidays here. If you can climb it, ride it, dive it or jump off it then I’m into it. I choose my destinations based on what I can do when I get there and I’m happy to share what I’ve discovered along the way. Street food that is unexpectedly spicy, jellyfish-infested waters, unforgettable landscapes, meeting local people who love where they live… the world is an amazing place, so you’re bound to pick up a few stories while you look around.